One of the most icon and most easily recognized vehicles on the road, the VW Beetle is one of the models that has stood the test of time! Its small design means it is incredibly fuel efficient and is also a fun and stylish model to use for any transportation needs that you may have. It seats four comfortably, giving everyone a thrill with the top down the sun shining bright and the wind whipping past! It’s great for fuel efficacy and has advanced safety features that will keep you and your passengers safe, wherever it is you are heading. 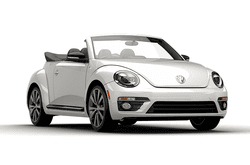 If you are looking for a classy ride that is as cute and powerful as you, then the classic Volkswagen Beetle is the rental car that is right for you!